The Surface Book is one of the best Windows 10 laptops. But its party piece is more than a gimmick. When detached from the body the screen makes for a decent, if short-lived, tablet that’s super slim and easy to hold. 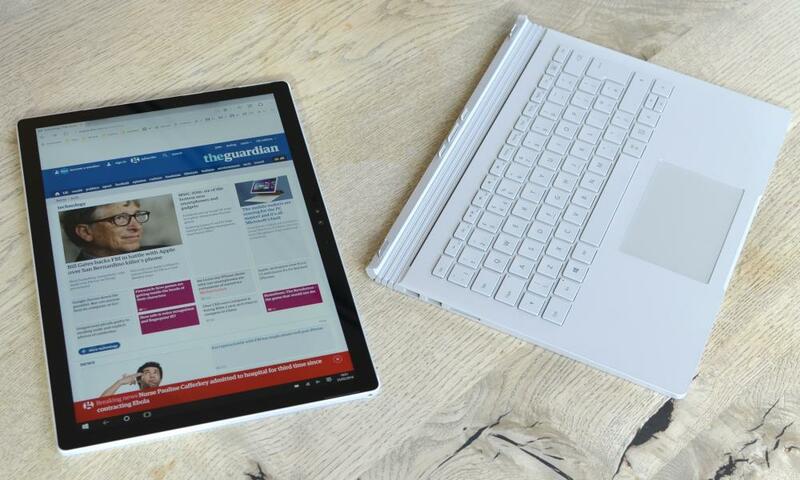 But the Surface Book is a different animal altogether: a laptop first, tablet second. It sounds like an odd distinction, but it makes quite a difference if the keyboard is your primary driver of a computer. Speaking of the keyboard, it isn’t just a dumb accessory. It holds a larger battery, an SD card slot, two USB 3.0 ports, a mini DisplayPort and a magnetic charging socket. But it can also have a discrete graphics card within it, depending on the model, giving the Surface Book much more grunt when required. The rest of the workings of the computer are included in the screen, which makes it even more remarkable just how thin it is. As you might expect, being a Microsoft-made machine, the Surface Book runs Windows 10, which is arguably the best Windows version to date. The software doesn’t really have any particular tweaks or customisations for the Surface Book that aren’t available on any other Windows 10 convertible. The operating system is both refined and a mess in equal proportions. The best way to describe it is a modern, overhauled user interface layered directly over the same-old Windows. Getting around, launching programs and daily business operates in this top layer and is genuinely quite easy to use and useful. But when you need to change something serious, uninstall a desktop program for instance, you get booted back into the same Control Panel I remember from Windows 2000 – it has barely changed. 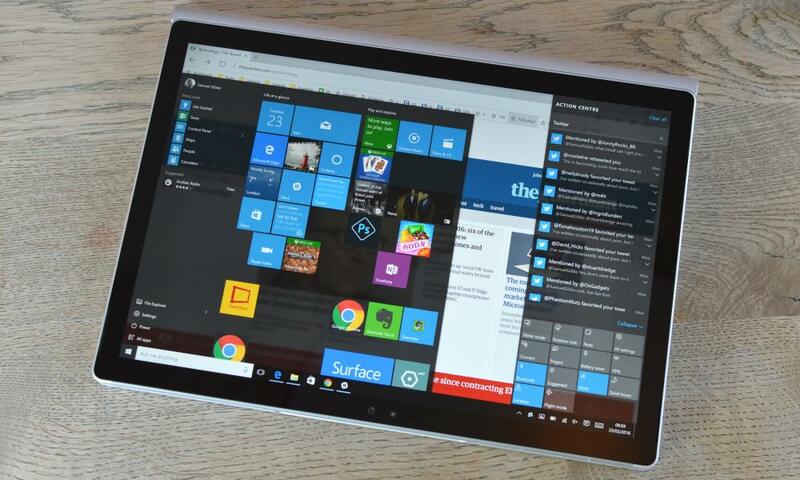 It’s powerful, of course, and you can get what you need done, but the difference between what is essentially the Windows 10 layer and the underworkings is quite jarring. For the uninitiated I suspect it could be quite baffling, particularly if you’re using your finger at the time and suddenly have to tap on tiny boxes. 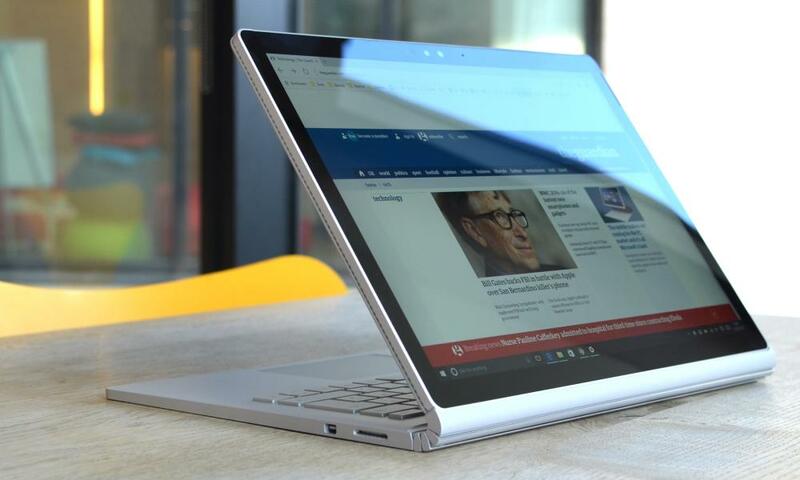 There are couple of things to note for the Surface Book. The first is Windows Hello, which recognises your face and logs you in without passwords, is fantastic and works as quickly as the computer can boot. Activating tablet mode actually helps when trying to tap things or use the Surface Book as a tablet. 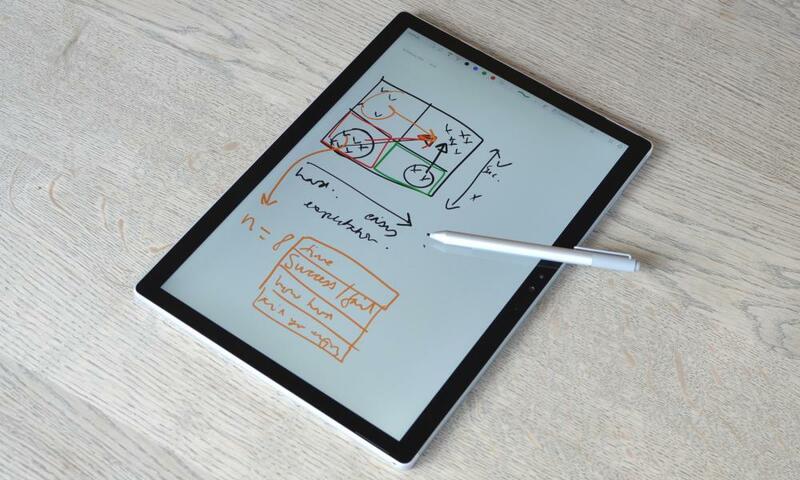 The Surface Book has a beautiful, high resolution and pixel-dense screen that has great viewing angles and looks brilliant, until you reach an app that can’t scale properly. In that case you end up looking at blurry icons and text – a really bad experience, which was all too common in my use of desktop Windows programs such as Evernote, various text editors and other programs. Apps from the Windows store don’t suffer from the same problem, but they’re often not as powerful. Evernote Touch is a good example, but it’s better than attempting to peer at a blurry mess. First and foremost, the Surface Book is the best Windows laptop I have ever used. Period. It’s fast, has an excellent backlit keyboard, really great trackpad, enough ports and it’s relatively light at just over 1.5kg. Some Windows laptops are thinner, some are lighter, but none have quite as good a combination of screen, keyboard, power and industrial design. I managed to get a good working day out of it on battery power and still had enough for a bit of light reading on the train home with the tablet. It’s worth noting, although not unique to the Surface Book, that being able to touch the screen for input is excellent, even when doing boring things like typing, as moving the cursor around is so much faster than using a trackpad. The tablet is held onto the keyboard by a very fancy “memory wire” locking mechanism, which changes shape when a current is applied across it. The mechanism is electronic: pressing a button on the keyboard or an icon on the screen disengages the tablet. You have to pull it directly up from both sides while holding the keyboard down. It sounds hard, but isn’t. Attaching it is just a case of plonking the screen over the connectors. The two then grip each other automatically. The screen can be placed either way around on the keyboard base, meaning like a laptop or inverted, so it can be folded down like a raised notepad on a desk or stood up as a display. 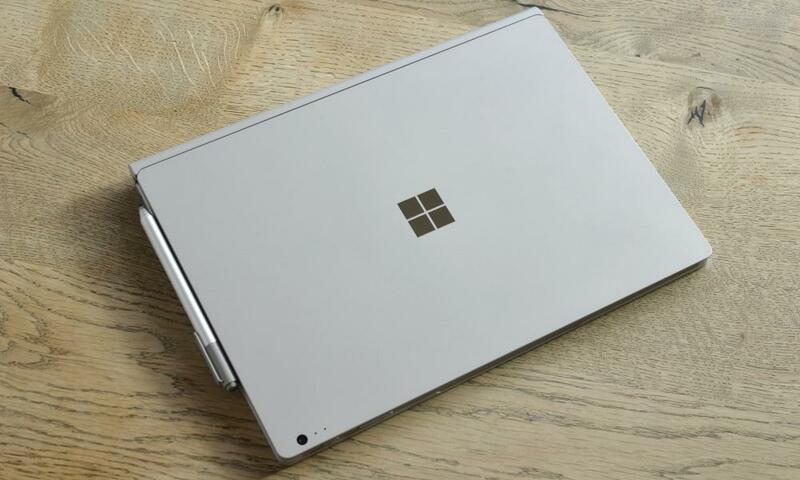 It’s worth noting that the tablet can only be detached while the Surface Book has power, which means if it dies in your hands then there’s no reattaching it or detaching it to flip it over and close it properly. The screen is very sharp, on a par with an iPad or Google Pixel C, while its 3:2 aspect ratio means it’s about the size of an A4 bit of paper. Websites, comics and books all look great. It has two front-facing speakers that are loud and clear for watching video, while the headphones port is in the tablet, not the keyboard. The 13.5in screen means its significantly bigger than most other tablets and at 726g it’s also pretty heavy. Despite being a full-blooded PC it’s still only 7.7mm thick, which is really quite impressive. That’s thinner than most smartphones. I managed to get around three hours of reading life out of the tablet with a decent brightness. Microsoft reckons it will stretch to four hours for video playback. The tablet can also be charged separately from the keyboard, should you need to. 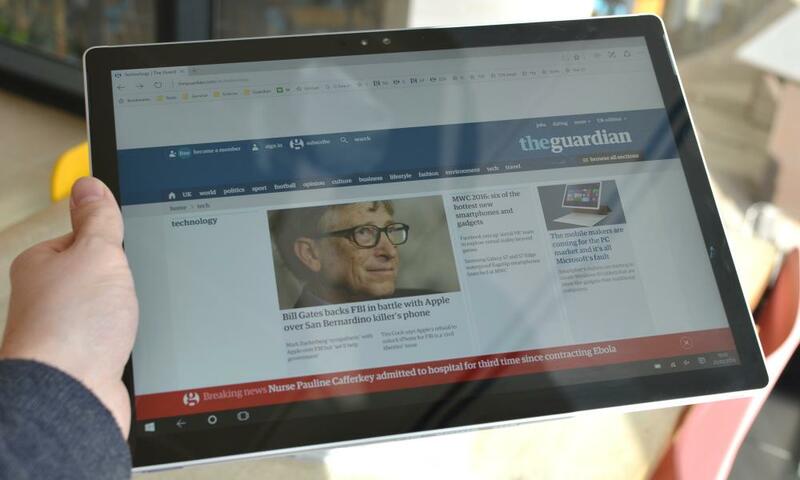 The biggest drawback of a PC as a tablet is that the instant-on nature of most other tablets isn’t quite as instant for Windows. It can be a couple of seconds if it’s shut down and not just asleep, which it does after a set period. Microsoft’s stylus is one of the best in the business, with a good weight and size. It magnetically attaches to the side of the screen, which stayed put when I was moving around, but got knocked off in a bag. It has 1,024 levels of pressure sensitivity and really does feel like a pen on paper. The nib can also be changed if you prefer a harder or softer feel. There are two buttons. One on the side acts like a modifier key for tap or drawing actions. The top button acts like an eraser and can be configured to launch various programs or perform actions when single, or double press or a press and hold. By default it launches OneNote on a press, which allows you to draw on the screen in a second or so. 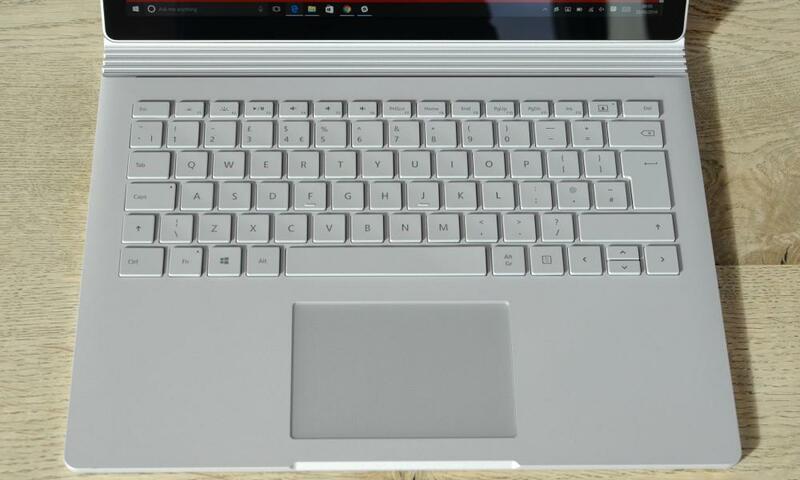 The Microsoft Surface Book starts at £1,299 for the base model with 128GB of storage, a Core i5 and 8GB of RAM, but without a discrete graphics card in the keyboard. The i5 version with 256GB of storage and a discrete GPU it costs £1,599. The Core i7 version with 256GB, 8GB of RAM and the discrete GPU costs £1,799 and with 512GB of storage and 16GB of RAM £2,249. For comparison, Apple’s 13in MacBook Pro (just laptop) starts at £900, Dell’s XPS 12 2-in-1 starts at £899 and Asus’s convertible T300CHI £800. A dock is available to turn it into a pseudo-desktop, with ethernet, USB, headphones and multiple mini DisplayPorts. However, a monitor that worked fine when plugged directly into the Surface Book wouldn’t work when plugged into the dock. The screen is great, the hinge is interesting and the mechanism for detaching and re-attaching works very well. The Surface Book is arguably the best compromise yet between a laptop and a tablet, if your main usage is going to be as a laptop. It solves the problems of the Surface Pro when being used on your lap or anything other than a desk. But, as a tablet, the apps available for iOS or Android for offline media consumption or similar are missing, as are mobile games. It’s also very expensive – but for that money you get a powerful machine, with an excellent stylus and a work-ready battery.